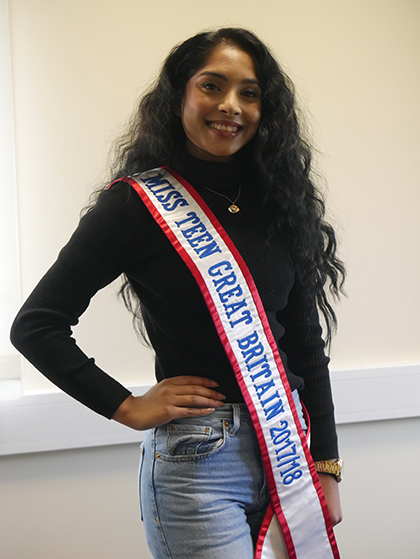 A student at The Sixth Form College, Solihull has been praised for her charity work by winning the Miss Teen Great Britain prize. Evanjelin Elchmanar (aged 16, from Birmingham) represented the Midlands in the competition, for which there were more than 2,000 applicants, and she impressed the judges with her work raising money for the charity Together for Short Lives. This charity supports seriously ill young children and their families. She raised more than £5,000 by holding bake sales, tea parties, selling food at funfairs and by singing at events. She has also raised over £20,000 for numerous other charities including Alzheimer’s Research UK and charities that raise money for natural disasters and those with life-threatening illnesses. She was named Interview Queen for this section of the judging process. Her title as Miss Teen Great Britain has seen her giving interviews to the likes of BBC WM radio. Her title also sees her attend charity events all over the country and she will be helping to judge Miss Earth UK. After she gives her title away next year, she will compete for England in Miss Teen Galaxy in Orlando, where she will be one of more than 60 global competitors. Evanjelin hopes to work in Interior Design and is currently studying A levels in Fine Art, English Literature and Geography, with ambitions to go to university.